Former Open champion Louis Oosthuizen made his first tournament appearance in Australia a winning one, shooting a one-under 71 for a one-stroke victory at the Perth International. The South African, who led by three strokes going into the final round, finished with a 16-under total of 272 in the tournament sanctioned by the European and Australasian PGA tours. Alexander Levy of France was second after a 66, followed by West Australian golfer Jason Scrivener, whose 69 left him in third place, two strokes behind. The win sees the Oosthuizen move ahead of countryman Branden Grace and back into fourth place for South African wins on the European Tour, and makes it six wins in 11 events for the Rainbow Nation this season. Korea’s Jiyai Shin shot a superb final round of four-under-par 69 at RACV Royal Pines Resort to capture the 2016 RACV Ladies Masters title by three strokes over Holly Clyburn from England in Queensland. Shin had held the overnight lead by two shots from Clyburn and Sweden’s Camilla Lennarth and she signed off in style with a birdie on the last hole in adding to her 2013 Women’s Australian Open win in Canberra. “I really wanted to win this tournament because previously I came second,” she said. “I really want my photo up with the past champions. I got a lot of motivation from each. I feel really good. I want to stay here. I love coming to Australia, it really feels like home. Adam Scott and Sergio Garcia share the lead heading into the final day of the Honda Classic after a third round which veered from the sublime to the ridiculous ‒ and back again. Scott carded a 66 and Garcia a 67 to finish nine under par at PGA National, four shots clear of American Blayne Barber, with halfway leader Rickie Fowler and Justin Thomas a shot further back. Fowler had not dropped a shot in the first 36 holes but failed to record a single birdie as he struggled to a 74, while playing partner Jimmy Walker started the day a shot off the lead but ended it 11 adrift after slumping to a 79. Garcia briefly opened up a two-shot lead with a hat-trick of birdies from the third, where he missed from five feet for eagle, and also birdied the eighth to move to 10 under par. 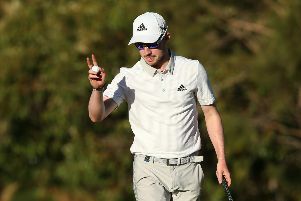 But former world No 1 Scott was not about to let the Spaniard out of his sights and followed his own birdie at the third with four more in succession from the sixth to reach the turn in just 30 shots. Further birdies on the 12th and 13th took Scott three shots clear after Garcia had lipped out for birdie from three feet on the 12th and three-putted the next, only for the Australian to then run up a quadruple-bogey seven on the 15th. Scott found the water twice on the first hole of the dreaded ‘Bear Trap,’ his tee shot coming up well short of the green and his third from the drop zone pitching on the back of the putting surface and rolling down into the lake. However, the former Masters champion bounced back with a birdie on the 17th to regain the lead, before Garcia birdied the 18th to leave the good friends tied at the top of the leaderboard. ‘I played really good again,’ Scott told Sky Sports. ‘I feel really happy with where the game is at. Shame about 15 but that’s this golf course, the Bear Trap got me today. ‘It was the wrong time to make a bad swing on the tee and it put me in an awkward spot. I thought I hit a good third shot but the wind did not get the ball at all and I ended up making seven, but it was nice to at least get one back. Northern Ireland’s Graeme McDowell is six shots off the lead after a 67 but knows he will likely need something even better on Sunday to win the title. ‘Anything can happen,’ the former US Open champion said. ‘But when you have the quality of guys like Garcia, Scott and Fowler at the top of the leaderboard it’s tough to expect all of them to come back to you so I’m probably going to have to shoot a low number to have a chance. Vijay Singh, 53, was alongside McDowell on three under after a 68 which included a four-putt from 16 feet on the 15th. Russell Knox, second and third in this event over the past two years, is 10 off the lead after a third-round 71.